Home / Desalination Technology / Should I Keep My Rainman Watermaker Portable or Install it? In just 10 minutes of receiving the system, you can make drinking water. No holes are put in the hull of your boat. Eliminate the expense of installation. 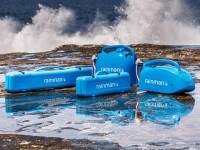 When cruising or racing, you can easily take the Rainman watermaker ashore. Move the system around to store anywhere you like on your boat and your situation changes. The entire unit can be shipped to a technician when maintenance is needed. This saves you time and avoids having to arrange for a technician to come aboard your vessel. Your Rainman can be loaned out to a friend to use on their boat. Fill your neighbor’s water tanks. You won’t have to pull the system out on to the deck every time you use it. No hoses on the deck during operation. You have the choice to partially install (PSU, RO Membranes, or both). You can uninstall and revert back to a portable unit anytime.